With school lunches, post-game snacks, and late-night study sessions, kids and teens often fall victim to eating the easiest food to grab on the way out of the house. Unfortunately, fresh meats, fruits, and veggies do not tend to be on that list of “easy foods.” Many are subject to eating packaged pastries or sugar-filled smoothies for breakfast, with lunch only getting worse from there. It seems like preparing meals beforehand is an easy solution. However, the easiest way to prep food for the week is by storing it in the fridge in plastic containers, which have come under fire lately for their unsafe chemicals that can leach into the foods your children eat. These chemicals have been linked to many illnesses in children, and families are advised to stay away from products containing them. But are there any alternatives to eating something other than junk food without letting junk into their food? Plastic has recently been linked to different sicknesses and ailments. In adults, plastic is correlated with autoimmune disorders, diabetes, birthing abnormalities, and impotence. In children, it has been linked to early-onset puberty, autoimmune diseases, diabetes, and several other disorders. Heating these plastics in the microwave is even more risky, as the heat causes the plastic to release these toxins directly into food! With plastic seeping its toxic chemicals into our food, toys, and cosmetics, it just isn’t worth it to continue putting our health, and the health of our children, at risk. That is why many families are switching to using plastic substitutes, toxin-free plastics, or new materials all together. The benefits of stainless steel dishes for kids significantly outweigh the time it would take to do a complete kitchen-dish swap! Stainless steel is a safe alternative to the plastics that may contain chemicals as as BPA, lead, and PVC. These chemicals have been linked to autoimmune disorders, diabetes, early-onset puberty, and more–making plastics a rather worrisome product to have in the house. With stainless steel dishes, the use is risk-free and can be beneficial to families! Stainless steel appliances and dishes are much safer than their plastic equivalents. With stainless steel, there are no questionable chemicals, and the insulation properties will keep food much fresher longer. Stainless steel also does not absorb toxins surrounding it, like plastic is able to do when heated, making stainless steel products the perfect container for any environment from the school cafeteria to the soccer field. Unlike plastic, stainless steel cannot get stained by the foods placed on it. Things like spaghetti sauce and taco meat do not leave behind a greasy residue; rather, these products are easily washed and cleaned, ready to look like new after each use and wash. Since they are so easy to clean, they are reusable (longer than plastic) and provide an easy-to-wash surface that can be washed by hand or placed into the dishwasher! This easily maintained product saves both time and money for families. Along with being easy to clean, stainless steel dishes do not carry any odor, as plastic containers often do. Eating any super pungent foods, such as cottage cheese or garlic, do not affect the condition of the product, nor does it leave any smelling residues (or tastes!) behind in stainless steel dishware. Many stainless steel dishes are lightweight and portable, making them ideal for students, teens, and children to pack into the backpack. They also keep food fresh and insulated longer, eliminating the need for bulky coolers and ice packs. 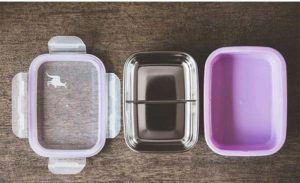 With their portability, children and teens can easily pick up snacks and meals in place of sugary, fatty foods, making stainless steel dishes the healthier choice. With prolonged use of plastics, the risk of generating any of the diseases above increase significantly. There is no reason to take a chance with unsafe plastics when there are so many better options out there, especially when those options are much more affordable than you might think. Toxin-free plastics and plastic alternatives are much safer, with stainless steel dishes and flatware leading the way to a healthier family. With its combined practicality, accessibility, and mobility, stainless steel dishes are a great addition to any family looking to rid themselves of the troublesome plastics and move forward into a healthier, happier lifestyle.